This little number is all about getting crafty with your knitting! A tiny hat called a fascinator, it’s sort of a cross between a hat and a hair clip embellished with feathers, flowers, or a veil. 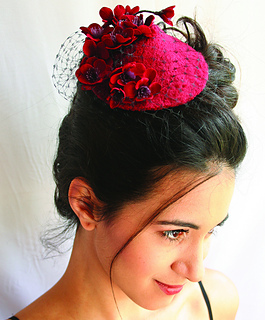 Fashionable women around the globe wear fascinators to cocktail parties, the races, and weddings. But you can wear yours anywhere you want to be noticed. Featured Yarn: Tilli Tomas Aspen (100% Merino Wool; 260 yds/100g). Color: Ruby Wine, 1 skein.